Sitemap to all pages covering the state of Nevada. Photography contributions by Alex Nitzman, Andy Field, Brent Ivy and others. Special thanks to Michael Ballard, Nick Christensen, Casey Cooper, Steve Hanudel, Dominic Ielati, L.J. Johnson, Jim Magin, Erik Slotboom, Kevin Trinkle, Joel Windmiller and Mark Yoshinaka for their efforts in supporting these pages. Mark was very helpful in creating various sign graphics found throughout the Nevada Highway pages. 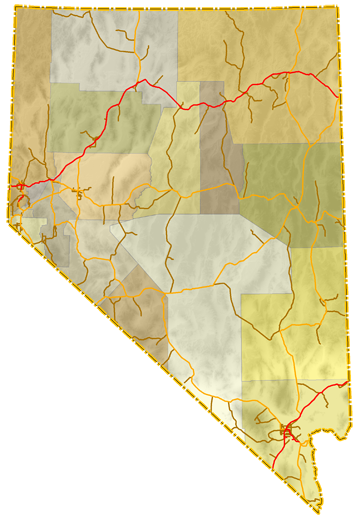 Route Log based on information from the January 2008 edition of Nevada&apos;s State Maintained Highways Descriptions, Index, and Maps. Each Nevada milepost has an abbreviation indicating the class of the route: “IR” for Interstate, “US” for U.S. routes, and “SR” for all state routes. Occasionally these markers are the only indication that a road is maintained by the Nevada Department of Transportation (NDOT). This page, and all the Nevada Highway pages herein, are in no way related to the state of Nevada or the Nevada Department of Transportation (NDOT). Please visit the Nevada State Department of Transportation for official road and highway information.